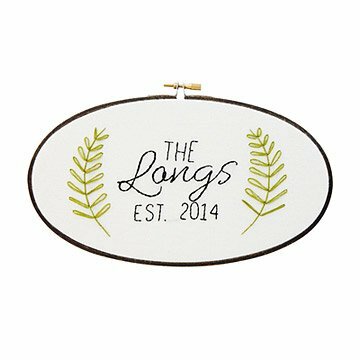 This sweet personalized embroidery makes your house a family home. Add homespun style to your family room or foyer with Jordan and Paul Kavuma's handcrafted embroidery. Each personalized piece is carefully stitched with your family's name, when you were "established," and embellishments with textured floral details. Mounted on a bamboo hoop, this sweet and simple art piece warms hearts and hearths for years to come. Handmade in Kentucky. Husband-and-wife team Paul and Jordan Kavuma met while working in Uganda, and started their textile company after moving back to the USA together and getting married. They each come from families that have a deep love of fibers. Paul's Ugandan mother is a seamstress that creates beautiful East African garments, while Jordan was taught by her grandmother to embroider, sew, and dye fabrics naturally when she was a little girl. These skills and influences anchor their art and process. "Every piece in our collections is designed and sewn by hand," they say. "The hundreds of stitches that go into each piece are intentional and we take pride in the character that each holds." Keep this item protected from moisture and from prolonged, direct sunlight. I would not buy this again for us, but I would recommend it. We hung it over the front door as it is visible from the living room. It is easy to hang as the embroidering hoop is still on it. It might not match with the rest of the decoration in the house if you need neat, unicolored frames.